At St Mary's Catholic Primary School we are fully aware of how worrying it can be when trying to ensure that your children are safe when using ICT equipment at home. That is why we have developed this new space on the website to give you up-to-date information on E-Safety at home. In school we are committed to providing the children with a range of advice on E-Safety issues and ensuring that they have the skills to be prepared for a continuously changing digital world. In order to tackle the wide range of E-Safety areas, the children have specific focuses for each term. In order to help you tackle a range of E-Safety issues at home, we have collated information from a few sources to help make sure you have as much information as possible. Social networking websites like Facebook, Twitter, Youtube, Instagram, MySpace and countless other web spaces, are services people can use to connect with others to share information like photos, videos, and personal messages. Recently, the Telegraph stated that ‘A new study finds around 59 per cent of children have already used a social network by the time they are 10, and 43 per cent have messaged strangers online by the age of 12.’ Therefore we felt it is important for you to have the facts on how to keep your children safe. This is a really useful guide to age resrtrictions on social media platforms. We understand peer pressure can lead children to demand from their parents that they have a Facebook account, or similar, but these restrictions exist for a reason (safeguarding) and it is really important to stick to them as much as possible. These days, Apps can be downloaded on almost all devices with access to the internet (e.g. mobile phones, tablets, laptops, consoles, Smart TVs etc...). Some Apps can be really fun or really useful. However, it is important to know what Apps your children are using and what they're for. 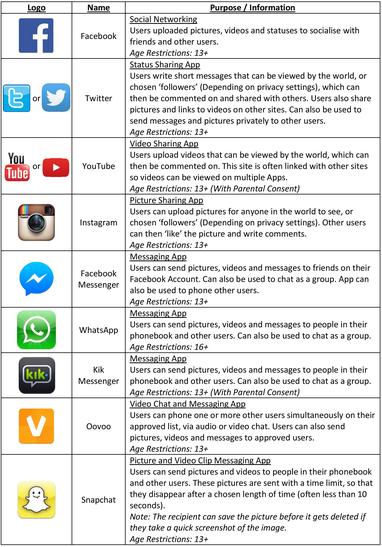 Below is a list of common Apps used by children to communicate with their friends and the world. Please take note of the symbol (as shown on their device) and the age restrictions. Here is an excellent blog post detailing apps and their uses by young people (and how they communicate with each other), designed to be read by parents. This, as with everything with the internet and technology, can become out of date very quickly. Please be aware of this. The internet is a fast-moving world! Within the guide (Below) you can find out about choosing age-appropriate games, setting up parental controls, and making sure their child’s video game experience is safe and secure.